Integrating your CRM and ERP systems delivers a complete view of customers’ needs, order history, account standing, etc. to your teams. Providing real-time visibility into the business information, empowers your teams to deliver superior customer service and build stronger relationships with your clients. For instance, sales representatives have access to customer information (e.g. account standing, customer specific pricing) and stock information so they can enter orders correctly. Customer service representatives can assist customer inquiries on order statuses or log complaints. Likewise, managers and executives will have access to detailed reports to use for forecasting, view sales performance, and to make better informed business decisions. A major headache for process manufactures and other organizations is the amount of redundancy of entering information in multiple systems for a number of business processes. For example, a sales representative will take an order, enter it into the CRM, and then email the order information to a CSR that will then enter it into the ERP to have it fulfilled. By integrating your CRM and ERP systems, when data is entered into one system that information will automatically be transferred to the other. This dramatically reduces the duplication of data entry. Additionally, entering data only once means the most accurate and current customer information is available to your teams. For instance, the pricing department updates product prices in the ERP that information will automatically be updated in the CRM for the sales team. Therefore, the sales team will have the latest accurate pricing information when creating quotes and orders. Furthermore, an integrated CRM and ERP systems with automated workflows will improve the pace of your business so that less time is spent obtaining information and more time is spent making well-informed decisions. For example, a sales representative enters an order, automatically triggering all related business processes and passing that order transaction seamlessly from the CRM to the ERP without the need for additional manual work. Thus, improving the productivity of your teams by eliminating any time-intensive manual activities or the re-entry of information from the CRM to ERP. 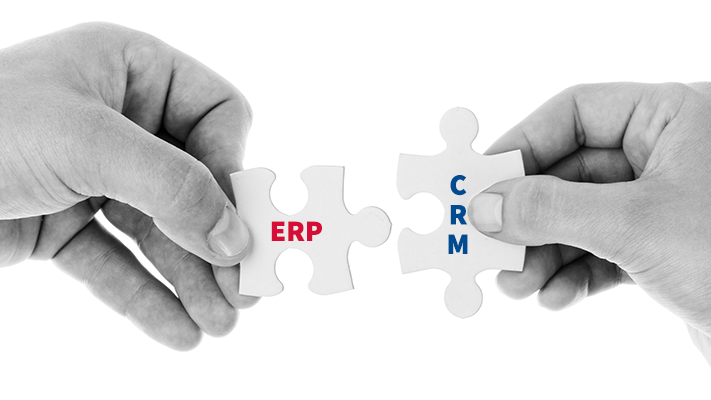 An integrated CRM and ERP system promotes quick, constant and accurate collaboration for effective decision making. Information gathered on a customer from sales, marketing, finance and other departments are integrated and instantly shared to enhance customer satisfaction and loyalty. The collaboration and communication between systems provides insight to more efficiently serve and retain customers by sharing customer data, streamlining processes, and aligning strategies. In addition, data shared between sales and other departments such as billing, operations, finance and planning creates cohesion and uniformity that delivers a uniform customer experience. As process manufacturers look to grow their business and improve their operations, they are turning to technology as the solution. Many already utilize CRM and ERP software solutions to help run their business. By integrating these two solutions together, process manufacturers will experience an increase in productivity and a boost to their profitability.